April 2, 2014, 2:34 a.m.
By Ken Doctor @kdoctor April 2, 2014, 2:34 a.m.
Today, we’ll hear official word of the demise of Project Thunderdome, one of the news industry’s highest-profile experiments in centralized, digital-first, mobile-friendly, new-news-partner content creation. Digital First Media CEO John Paton first announced the creation of what became a 50-plus person, New York City-based operation three years ago. In the closing, and in other cuts at Digital First Media, we see the impact of unending high-single-digit loss in print advertising. The ongoing devastation in print is overwhelming even DFM’s relatively faster pace of digital innovation. The move also signals the fatigue of majority DFM owner Alden Global Capital — and that it is readying its newspaper properties for sale. They’re not yet on the market, but expect regional auctions of DFM properties (with clusters around the Los Angeles area, the Bay Area, New England, Colorado, Texas, New Mexico and Pennsylvania) — unless Alden can find a single buyer, which is unlikely. Closing Thunderdome is just part of a major north-of-$100-million cost cutting initiative that is putting the best glow on some tough financials. The reason for the sale: Despite CEO John Paton’s aggressive remaking of the company, Alden’s investments in cheap newspaper company shares (“The Demise of Lean Dean Singleton’s Departure and the Rise of Private Equity”) haven’t worked out the way private equity bets are supposed to. Some of the biggest impacts from this change will be felt in southern California — already facing an uncertain ownership situation at the Los Angeles Times, questions about sustainability at the Orange County Register (soon to be joined by a Los Angeles Register), potential changes further down I-5 (more on that below), and now DFM’s papers facing question marks. The idea of Thunderdome was to use DFM’s scale to provide its many local properties with a deeper, richer product than they could produce on their own. Thunderdome produced national-ready topical sections on core topics that could also be localized, which some of the bigger DFM properties (San Jose Mercury News, The Denver Post) have done more of than smaller-staffed dailies. Thunderdome only had time to roll out about eight of its topical sections, less than halfway through its original plan. Those — national/world news, health, tech, travel, food, pets, baseball — are in place at DFM’s 75 sites. In its short life, Thunderdome showed promise, with multimedia and data-rich specials, including Firearms in the Family, Decoding the Kennedy Assassination and an interactive March Madness Bracket Advisor. A four-minute best-of video now will serve as an historic marker of Thunderdome, an experiment short-circuited, another case of digital journalism interruptus. Jim Brady (“What’s Project Thunderdome, you ask? Inside Jim Brady’s new job at Journal Register Company”) has been a prime architect of Project Thunderdome, most recently as editor-in-chief of DFM. Brady’s own career trajectory tells us a lot about the travails of digital innovation in the newspaper industry. A sports guy who, as an early editor of washingtonpost.com, helped make the Post a clear leader in web news, Brady decamped after a major management shuffle at the Post. He moved over to TBD, the Allbritton D.C. local news startup that aimed to create a new model of TV-partnered, blog-driven, visually strong local news. Its rise seemed meteoric, and so did its fall, as advertising didn’t meet expectations and disagreements between Brady and CEO Robert Allbritton torpedoed the project (“The newsonomics of TBD”). Now, Brady’s bid to once again reshape digital news is on hold. Thunderdome wasn’t universally received well within the company. Talk to the locals and you heard grumbles. Traffic to the new Thunderdome sections didn’t impress them. They didn’t like national imposition on local news judgment. 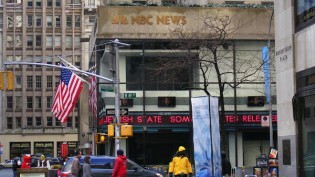 That grumbling, however right or wrong, isn’t surprising: For 20 years, national news chains have bobbed and weaved through different ideas about national news centralization — first in print and then in digital. Only more recently, as the financial vise has tightened further, has accepting such centralization been seen as an inevitabilty. (Consider Gannett’s recent efforts to print sections of USA Today in some of its local dailies.) If it’s inevitable, the big question is execution: How good a product are you giving the readers, and is it better than what individual papers can do? With Thunderdome folding, the creation and production of national content will presumably fall back to the papers — though don’t expect new resources to be added back, even though some were cut in the move to Thunderdome. Why does Project Thunderdome have to be in New York City? Whatever the merits of the new Thunderdome sections — my own sense is that they show a good diversity of content and could have evolved well in their presentation — it’s clear that Thunderdome’s elimination is driven by cost-cutting. One DFM project, Project Catalyst, has swallowed another, Thunderdome. Catalyst is aimed at taking more than $100 million out of the company’s costs, a number a little greater than Tribune’s much publicized $100 million cut ordered by CEO Peter Liguori last fall. Recent DFM cuts in Philadelphia and the Bay Area, eliminating dozens of jobs across all divisions, are part of that process. 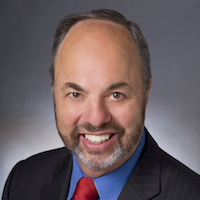 Catalyst is led by Steve Rossi, a former Knight Ridder COO, who recently moved into that same position for DFM. Thunderdome’s demise, in least in the short term, helps DFM achieve its Catalyst goals, saving about $5 million a year. The end of Thunderdome has got to be a bitter pill to swallow for CEO John Paton, who declined to comment to me on its termination. Thunderdome has been a keystone of his argument for faster change in the news industry. Good morning. It’s a very strange thing for me to be preaching to the converted as I am doing here today. 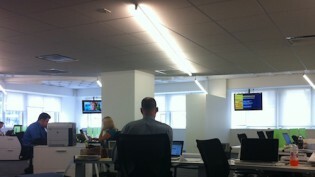 I am used to rooms full of print journalists and newspaper executives searching for any flaw in my pro-digital speech. Many of them usually hoping that the Internet isn’t going to get to their town and they won’t have to change what they do. But perhaps — as the digital leaders of your own companies — you will recognize some of the same issues we face. You will certainly recognize them if you are from an old-line legacy business — newspapers, radio, or television — and your corporate leadership believes they have a digital strategy because they stuck the suffix “.com” behind the brand name. Or created a digital division, put you in charge, and then gave you the equivalent of peanuts to run it. Undoubtedly, though, Paton’s been right on the need for faster transformation. His early presentations showing newspapers’ disproportionate press-and-trucks cost structure were clear-eyed. His investments in marketing service leader AdTaxi, in video, in blogging, and now in mobile stand out. The many efforts of the company, detailed in the Lab’s Encyclo entry, to break out of the newspaper mold are impressive. He says his company’s operating profit is up 40.8 percent from 2009 to 2012. Paton parlayed a small hand on a way-down-on-the-food-chain (Journal Register Co.) into a major U.S. digital news company. Readers have seen the major changes wrought at the JRC papers, which Paton had run the longest (since the beginning of 2010), though fewer at the bigger metro-oriented MediaNews papers he later took over. Changing the MediaNews metros has been a tougher nut to crack. Where DFM goes from here is increasingly unclear. How much can now be invested in digital growth, and how much more cost cutting will its owners require? How soon will papers be put on the market, and how quickly will new owners appear? 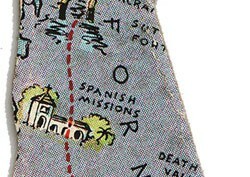 One unsettled geography looking for answers to those questions is southern California. In the region stretching from Ventura County, north of L.A., down south to San Diego, live 22 million people. Every one of the metro dailies in the region has seen new ownership in the last seven years; at least four bankruptcies have ruptured a once-vital newspapering region (“The newsonomics of the death and life of California news”). 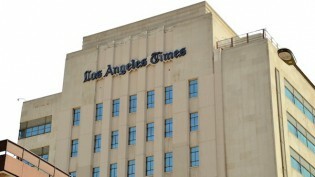 Today, the Los Angeles Times is set to become part of the newly spun-off Tribune Publishing, just as the Aaron Kushner’s Orange County Register moves 50 staffers into the county, publishing a seven-day L.A. Register April 16, after buying and beginning to regionalize the Riverside Press-Enterprise last fall. 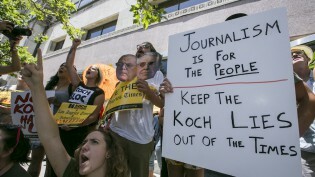 And don’t forget the Koch Brothers-buying-the-L.A. Times intrigue of last summer. And if Alden puts DFM’s Los Angeles News Group on the market soon, it may not be the only property for sale. In San Diego, word on the business street, now rebounding among a number of daily publishers around the country, is that the ownership of the San Diego Union-Tribune, now renamed U-T San Diego, wants out. That’s right: Rumor has it that flamboyant owner Papa Doug Manchester (good David Carr rundown on the “pro-business” Manchester era) wants to sell. His sometimes-CEO John Lynch has been assigned the task of finding a buyer, that rumor says. Lynch has previously talked publicly about wanting to buy more papers. 2014 is sure to bring more churn to the newspaper industry — and it’s looking like southern California could end up being the epicenter of all that change. 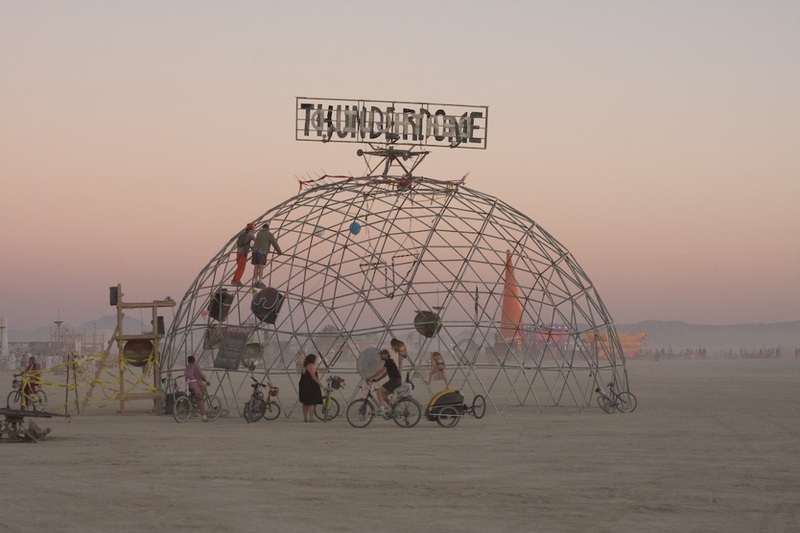 Photo illustration of a different thunderdome — at Burning Man 2010 — by Mayhem Chaos used under a Creative Commons license. POSTED April 2, 2014, 2:34 a.m.